Engrossing historical fiction from the Scott O'Dell Award-winning author of The Green Glass Sea! It is 1946. World War II is over, ended by the atomic bomb that Dewey Kerrigan's and Suze Gordon's scientist parents helped build. Dewey's been living with the Gordons since before the war's end, before her father died, moving south with them to Alamogordo, New Mexico. At the White Sands Missile Range, Phil Gordon is working on rockets that will someday go to the moon; at home, Terry Gordon is part of the scientists' movement against the Bomb. Dewey and Suze have conflicts of their own. Where does a girl who likes physics and math fit in? How do you know the right time to speak up and the right time to keep your head down? And, most important of all: What defines a family? Ellen Klages was born a in Columbus, Ohio. She graduated from the University of Michigan with a degree in Philosophy. “It teaches you to ask questions and think logically, which are useful skills for just about any job.” she says. “But when I looked in the Want Ads under P, no philosophers. I’ve been a pinball mechanic, a photographer, and done paste-up for a printer. “I’ve lived in San Francisco most of my adult life. The city wears its past in layers, glimpses of other eras visible on every street. I love to look through old newspapers and photos, trying to piece together its stories. “I was at the Exploratorium, a hands-on science museum, working as proofreader, when they were looking for a science writer to do a children’s science activity book. No science background, but I convinced my boss that in order to ‘translate’ from a PhD physicist, I had to ask lots of questions, just like a curious kid. I got the job. “My co-writer, Pat Murphy, a science-fiction author, encouraged me to write stories of my own. I’ve now sold more than a dozen. 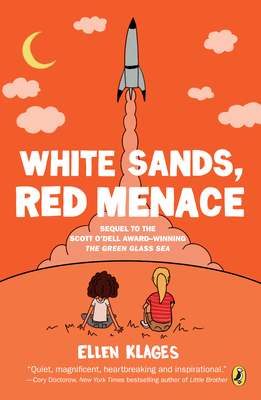 “Basement Magic,” a fairy tale set at the beginning of the Space Age, won the Nebula Award in 2005. Ellen Klages lives in San Francisco. The Green Glass Sea is her first novel.